The case on the left is a vacuum metallized Darth Vader case that was used to test the metallization process for the C-3P0 cases. About one hundred of these cases are known to exist, and of course, due to the exposure of this piece in Steve Sansweet's Star Wars: From Concept to Screen to Collectible, there are numerous fakes on the market. 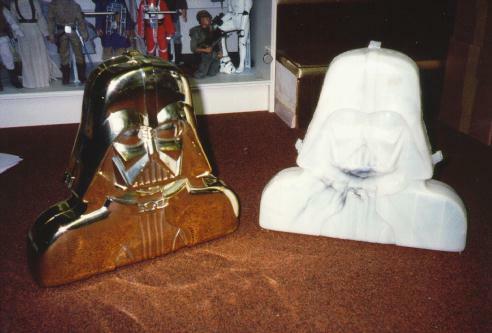 The case on the right is a white mold test for the Darth Vader case, with the appearance of a white marble finish.